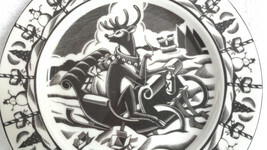 Home » Old Time Treasures » 222 Fifth Slice of Life Bad Reindeer Naughty Plate Drinking & Smoking! 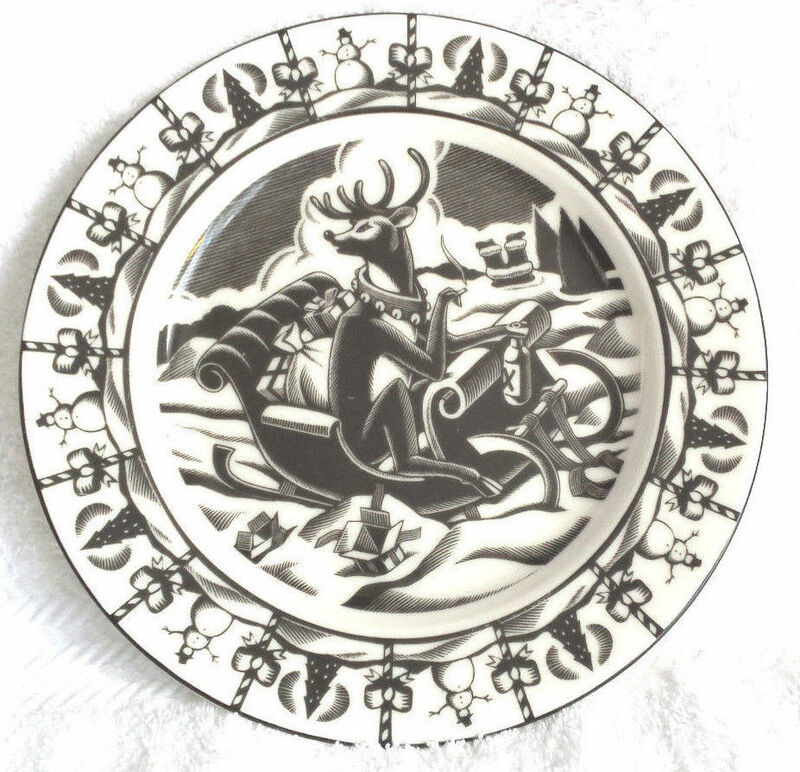 222 Fifth Slice of Life Bad Reindeer Naughty Plate Drinking & Smoking! I have a generous and fair, but limited, return policy for vintage and used items. Unless otherwise noted in my listings, all item(s) may be returned for a full refund within 30 days of receipt. All items must be returned to me in the same condition they were sent, prior to a refund being credited back to buyer. Condition will be based on the original listing description and photos. Buyer must contact me within 14 days of receiving an item to get approval for a return. Buyer will then have an additional 14 days to ship the item back to me. Buyer is responsible for return shipping fees. Return shipping must utilize the same shipping method I used, generally USPS Priority Mail or USPS First Class, and, requires delivery confirmation. In addition, any item being returned that has a value of $50 or more, will need to be insured. There will be a 20% restocking fee for all returns. Please note, If I’ve grossly misrepresented an item, I will cover all return shipping costs and waive the restocking fee. With that said, please read my policies regarding the description of antique, vintage, and used items. 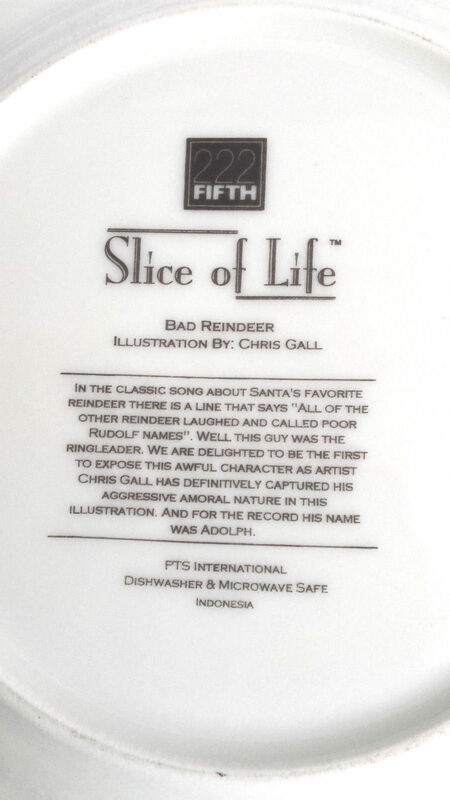 222 Fifth Slice of Life Bad Reindeer Naughty Plate Drinking Smoking! 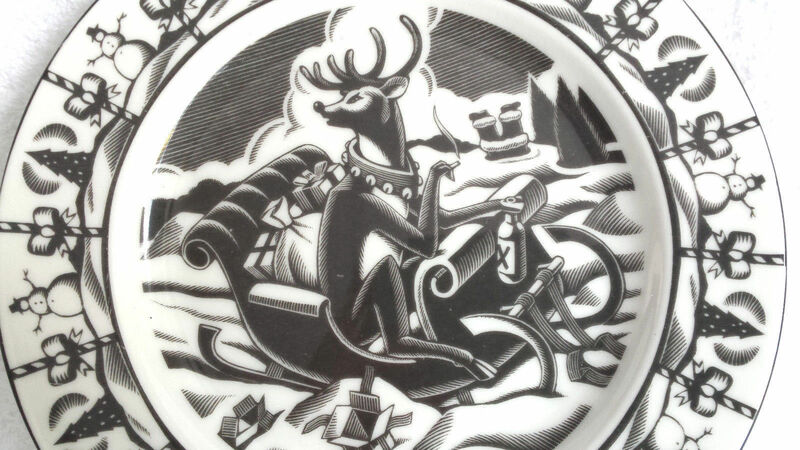 Bad reindeer.....BAD! 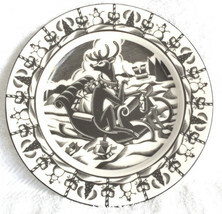 222 Fifth, Slice of Life, Naughty reindeer plate. 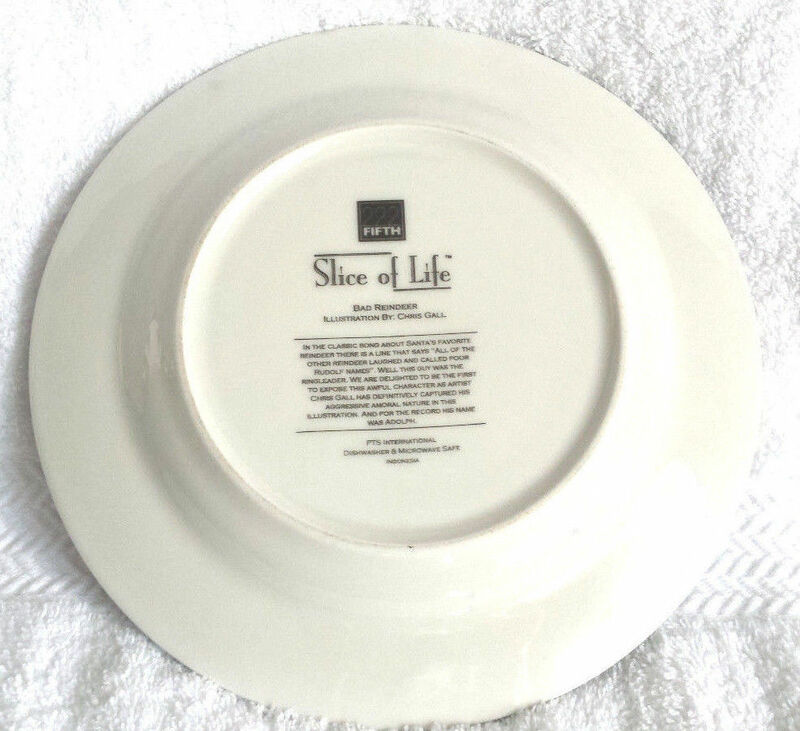 8" plate. No chips or dings, some light wear to the paint. Please view all pictures carefully, as they are a big part of the description, and ask all questions prior to purchasing. Payment is expected within 2 days for sales, immediately, for BIN (buy it now) listings, unless you're buying more than one item from me, if this is the case, please wait until I send you a combined item invoice with the correct shipping amount, before paying. Shipping Returns Describing Used Items Talk to me! I generally ship within 1-2 business days of payment. The majority of packages are shipped USPS Priority Mail. Other forms of shipping are possible depending on the situation. Feel free to let me know if a different carrier would work better for you. I'm happy to combine shipping if you would like to purchase more than one item from me. If you do purchase multiple items, please wait for me to send you a combined item invoice before paying. Some shipping quotes are my best guess. If I have quoted more than the actual shipping price I will refund the difference, less any packaging fees. If I quote under the actual shipping price, I'm happy to pay the difference myself! I have a generous and fair, but limited, return policy for vintage and used items. Unless otherwise noted in my listings, all item(s) may be returned for a full refund within 30 days of receipt. All items must be returned to me in the same condition they were sent, prior to a refund being credited back to buyer. Condition will be based on the original listing description and photos. Buyer must contact me within 14 days of receiving an item to get approval for a return. Buyer will then have an additional 14 days to ship the item back to me. Buyer is responsible for return shipping fees. Return shipping must utilize the same shipping method I used, generally USPS Priority Mail or USPS First Class, and, requires delivery confirmation. In addition, any item being returned that has a value of 50 or more, will need to be insured. There will be a 20% restocking fee for all returns. Please note, If I've grossly misrepresented an item, I will cover all return shipping costs and waive the restocking fee. With that said, please read my policies regarding the description of antique, vintage, and used items. Thank you :) I purchase a wide array of items, mostly pre-owned, in various conditions, and with unknown histories. I simply cannot claim that they haven't been altered, enhanced, etc. Most items will show some signs of age, wear, and patina, which might include scuffs, mars, scratches, nicks, yellowing, missing parts, etc. Please accept that the item you're considering may display any, or all of these signs before purchasing. With that said, I make every effort to describe any imperfections noted and take lots of pictures for buyer viewing. Please view photos carefully and ask all questions prior to purchasing. I'm happy to take more pictures if needed. Communication is key to transactions on the internet. If you have any questions or concerns regarding an item you've purchased from me, please use's messaging service to contact me. I check it frequently and will get back to you as soon as possible. I want all my transactions to be happy ones :) and I will do my very best to address all concerns. Thanks for looking!